Property 12: Log Cabin Right on the Kenai River with over 500 feet of riverfront access! 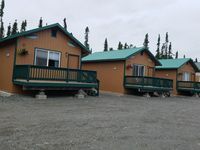 In Kenai close to shopping, beach, and river! 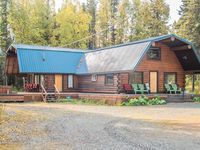 Property 16: In Kenai close to shopping, beach, and river! Property 23: "The Lincoln Cabin in the Forest"
Very large cabin with lots of room! Very clean. Traveled with husband and older kids. Good size cabin to use as a home base to see the surrounding area. We travelled to Homer, Seward, Kenai Fjords glaciers, and went fishing on the Kasilof. The owners were accommodating and helpful so we could enjoy our vacation to its fullest. So sad we didn't catch enough fish to use the freezer available on site! Would return to Soldotna in a heartbeat, and this is where I'd stay.